For many centuries in the Middle Ages, the basics of fashion for men and women remained the same - a gown for women and a long or short robe or tunic for men. Fashions for sleeves, hats and shoes could be more fleeting or even extreme and it's those I'm looking at today, particularly in Britain. The sleeveless tunic, based on a knight's surcoat, was a popular clothing choice for medieval men. Then in the middle of the 13th century there was a brief fashion which added wide sleeves to the tunic and sometimes a hood, turning it into a garment called a gardecorps. This was intended to replace the surcoat and cloak, combining both into a single item, however it never really caught on. Still with sleeves and male fashion, the bag-sleeve for men, a wide, baggy sleeve snug at the wrist and shoulder, was popular for about twenty years around 1400, but again never really caught on. For medieval women, hair and headdresses tended to be 'the thing'. Between 1130-50 there was a fashion for noble women to wear their hair long in plaits and for them to sheath these plaits in silk, usually white with red circular stripes. These sheaths were called fouriaux. However it was with headdresses that medieval noble-women especially indulged and which set the medieval clerics scolding about excess and vanity. A brief fashion, lasting roughly thirty years, was the heart-shaped head-dress, a headgear designed with two 'horns' on either side of the woman's head. Sometimes these headdresses became even wider, which caused a cleric of the time to remark: "She is hornyd like a kowe... for syn." 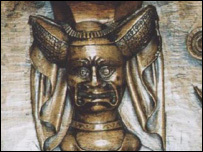 At Ludlow, within the church of St Laurence, there is a misericord carved with a woman portrayed as a scold - and wearing a horned headdress. Women in later years wore the steeple headdress or hennin, a tall cone arrayed with long, flowing veils, although this tended to be a European than British fashion. This was also railed against by clerics, particularly in France. All classes craved fashion, as can be seen by the various sumptuary laws passed in 1363 and 1463 which tried to stop 'lower' classes dressing in furs and certain fabrics and aping their 'betters'. Such acts made no difference as people loved to dress up. Men's vanity was often shown in shoes. Piked shoes - shoes with points - were popular with men in the Middle Ages, although the length of the points varied through the years. The truly exaggerated points were a short fashion. The idea that men wore the long points with chains attached to their knees to stop them tripping up may simply have been a mistake or a later urban myth. However, such cramped shoes did cause medieval people to have real problems with their feet, similar to those found in women of the 1950s who wore pinching, pointed-toed stilettos. An archaeologist working in Ipswich found evidence in a medieval cemetery of people with painful feet as a result of their shoes. Everyone, it seems, suffers for fashion, no matter how short-lived that fashion may be. I like fashion, even the extremes sometimes, but good gosh I have no idea why fashions go to the extreme they do now, and in the past??? It has to be some genetic characteristic being expressed. Fascinating to think that fashion is not a modern 'fad'. Over the centuries as fashion becomes more and more extreme it makes you realise that we are somewhat lucky to be to be more comfortable in our clothes.